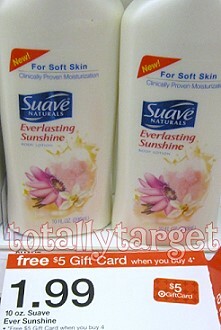 Some areas only got a .25/1 in the 7-29 RP- but you could still use two of the .25/1, two of the .50/1 Suave Lotion HERE, the Target coupon and pay .46 for 4 or .12 cents each after coupons & Gift Card. I hope y’all find the 10 oz bottles too! For more updates on the Unilever Deal- check out my Post HERE. I didn’t find a Suave coupn for $1 off, mine were $0.25 off 1. Some areas only got a .25/1 in the 7-29 RP- but you could still use two of the .25/1, the Target coupon and pay $1.46 for 4 or .36 cents each after coupons & Gift Card. The $0.50/1 that Kerry linked to in the Unilever post is still working! There’s a limit of 2 like coupons, so use 2 of those and 2 $0.25/1 coupons to pay just $0.46 for all 4! i’m confused. why can’t you use 2 of the $1/2 target coupons? @Lauren- you can only use one Target coupon per transaction per coupon policy. My Target did not have the $1.99 lotion- cheapest was $2.99. Some Target’s do allow multiple TQs per transaction, it’s their discretion I think to accept more. Hey Zack- the one on the Unilever site states 18 oz or larger I am almost positive- which is why it is not included in the deal since these are 10 oz lotions. The RedPlum printable actually excludes 18 oz so perfect for this transaction! And I have been able to print this 3 times so far…..
My comments disappeared. The $.50 coupon on Making Life Better IS valid for the 10 oz. I just printed 6 of them and they all state EXCLUDE 18 oz. This can be added to transaction above!! Wow this is a great deal, thanks so much! I will be stocking up! @Kerry, I think the wording on the coupon from the Unilever site is weird “excludes trial, travel sizes, and 18 oz or larger”, which seems to me they would have to take it for the 10 oz size. You’d think they would have just said only good for 18 oz and larger. I would not misuse a coupon but I think that the wording means they would have to take it. Yes very strange guys- when I had printed this coupon prior I could of sworn it was for 18 oz or larger. SInce I already printed it & used it I couldn’t print again- but I just had a friend verify for me. And although the wording is odd- it does look to be valid to use on the 10 oz size. I have updated the post. Thanks guys! My Target in South Florida had it for $3.09. I bought 2 boxes of diapers as a first transaction and got a $5.00 gift card. Next transaction I bought 4 of the lotions and use dthe coupons, plus the $5. card from the first transaction. Got me around $4. I was desperatly in need of lotion and I figured this deal wasn;t too shabby….wish the prices were universal…. I have 4 targets tht we shop at and 3 out of 4 will accept (according to their “NEWLY REVISED CPN Policy), 4 Coupons per person. They wouldnt even take reg. manu coupons over four! And not all coupons have limits except per purchase. Weird.. I had a hard time @ target today trying to do this deal.The cashier gave me a hard time like she was bothered that i had coupons.The two printable fifty cents off coupons would not scan so she would not take them.Then went to customer service to see if they could help, she stated the coupon would not work because it says eighteen ounce only.What that is not how the coupon read!! I love Target but what a big hassle today! I can’t print Unilever coupons…it keeps showing “we’re working on your coupons…” Boo! I want those coupons! @ Tanya – I too had a horrible experience at Target while I was trying to get this deal. My Target didn’t have the 10 oz so I got the 18 oz. I had four bottles and two $0.25/1 coupons and two $0.50/1 coupons from Redplum. As soon as I gave my coupon to the cashier, she ran right away to a manager and after two minutes of whispering, she came back and told me I could only use ONE coupon. I was so surprised, I asked her why and she said she didn’t know only the manager told her that. I talked to the manager and she told me that she could only allow me to use one coupon for the entire purchase because the new policy is limit one coupon per purchase. I tried to explain to her the difference between a purchase and a transaction. She kept saying no no no. I asked to speak to a different manager and she said that all of them were in a meeting and I just had to deal with her. People were starting to stare so I just left the store without my lotion. I was so upset. I expect stuff like this from Walmart but not from Target. Target is my favorite store.